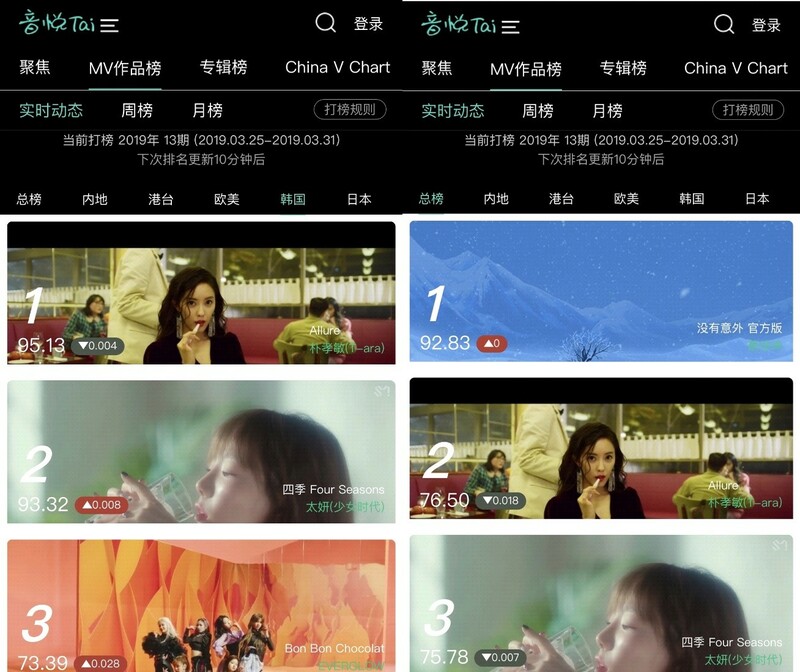 Singer Hyomin’s "Allure" China's largest MV site Inweitai, ranked No. 1 on the Korean regional chart for the fifth week. Singer Hyomin has made a comeback with "Allure." And topped the rank in china. One month after the release of Hyomin's mini-album "Allure," released in February, the title track "Allure," has still topped China's largest MV site, "Inweitai," for the fifth week, as well as solidly maintaining its No. 2 position on the overall chart. Hyomin released "Nice Body," "Sketch," "MANGO" and "U Um U Um" to continue her active activities in the Chinese region. In addition, she boasted of her extraordinary power by taking the top spot on the Chinese V chart on the U.S. Billboard. The latest release of "Allure" cheered fans with its unique charm, ranging from Hyomin's signature pleasant energy to an enchanting atmosphere with a hint of maturity. Her charming music spectrum, which was recognized by the public through colorful music, works well on the continent as well, and is loved globally. Hyomin is continuing her musical career with her unique charm by shooting into the hearts of Chinese fans.